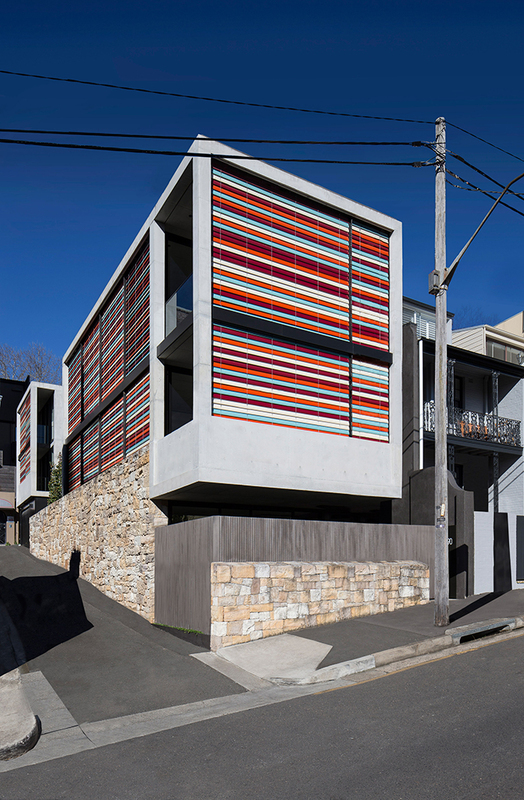 Brightly coloured louvres screen the living spaces of this Sydney residence, which are contained in a pair of concrete boxes and set atop a sandstone plinth. 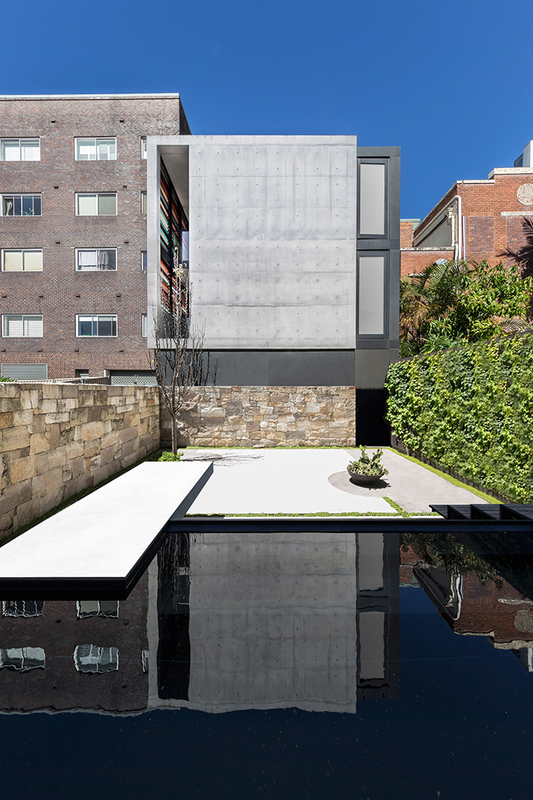 The Brougham Place property is located on a corner plot in the city's Potts Point neighbourhood, which was previously occupied by a typical brick-clad dwelling. 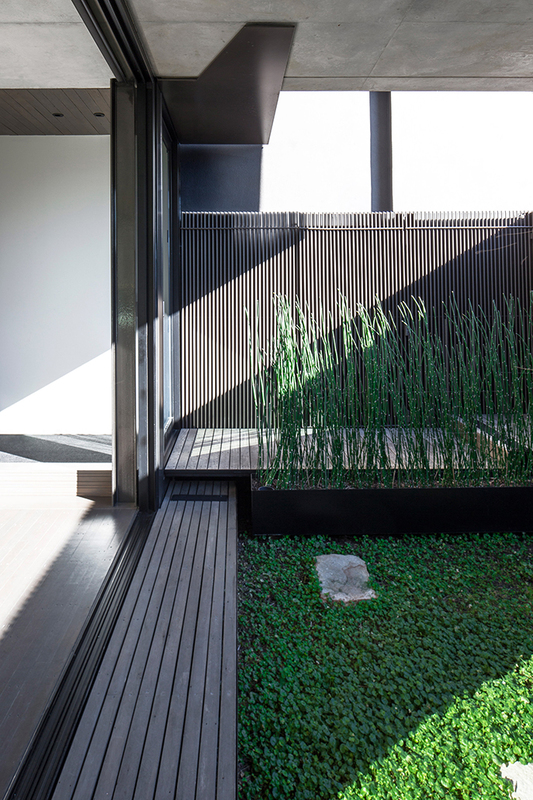 The need to accommodate a range of spaces for living and working prompted local architects Smart Design Studio to divide the new house into two distinct parts arranged on either side of a central courtyard. "This opened up the dynamic potential of the site," said the studio, "allowing very careful consideration of volume, scale and openings in response to the surrounding built form, while the planning pursued the interplay of shelter and openness, private internal and shared outdoor spaces." 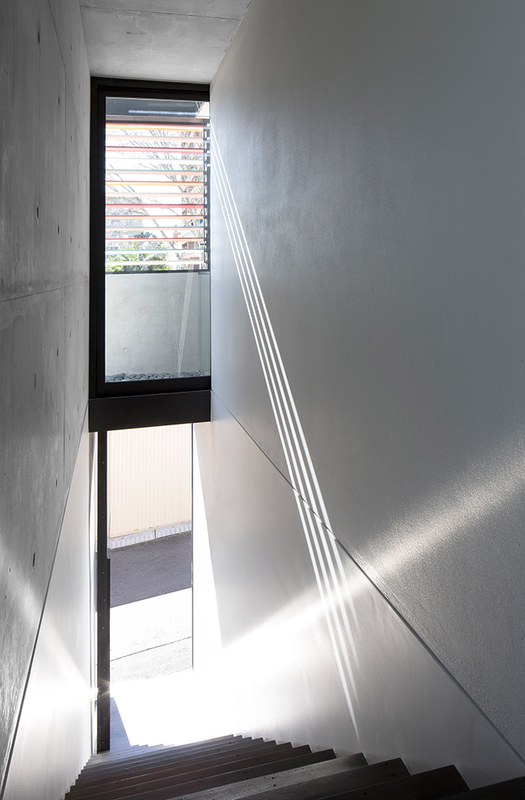 Drawing further inspiration from the existing streetscape and the owners' fondness for modernist architecture, the house's design is intended to recall the residential buildings of Le Corbusier in its composition of simple volumes that combine exposed concrete and colourful details. 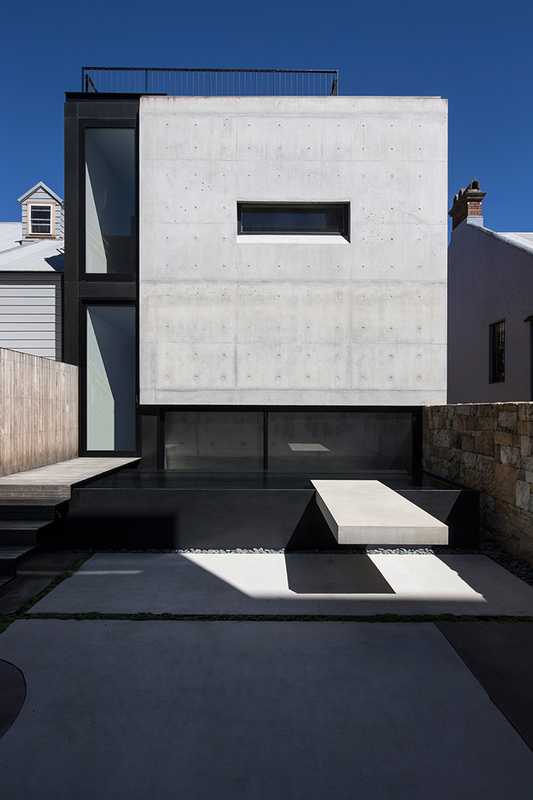 At street level, sandstone salvaged from the demolition of the original building is used as a base for the house. The stone forms a solid, textured perimeter that wraps around the front facade and the lane along one side. 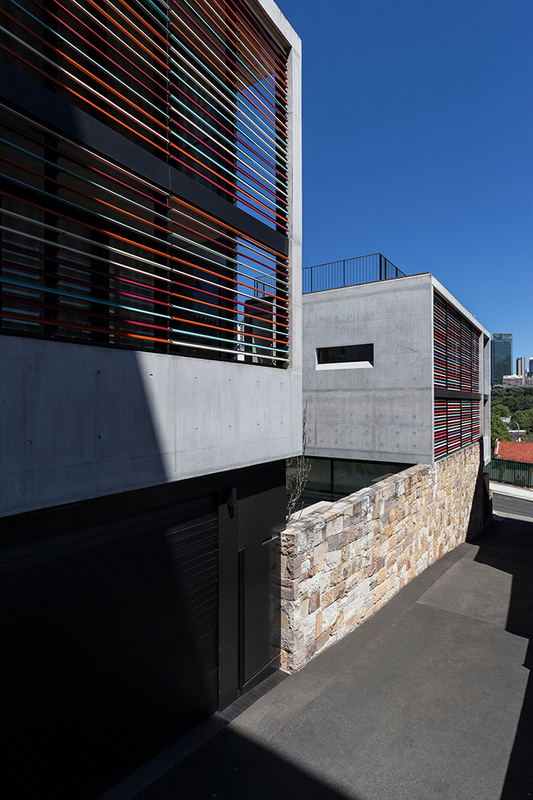 Above the rough sandstone base are two concrete boxes featuring large openings filled with coloured louvres. The choice of colours is influenced by the palette favoured by modernists like Le Corbusier, as well as by elements found throughout the neighbourhood. "This deliberate modern aesthetic provides strong juxtaposition to the historic nature of the site and context," said the architects, "while incorporating materials and colours that are familiar to it." The positioning of the two upper volumes responds to the topography of the site and the need to shelter the central courtyard, while preventing overshadowing of neighbouring properties. 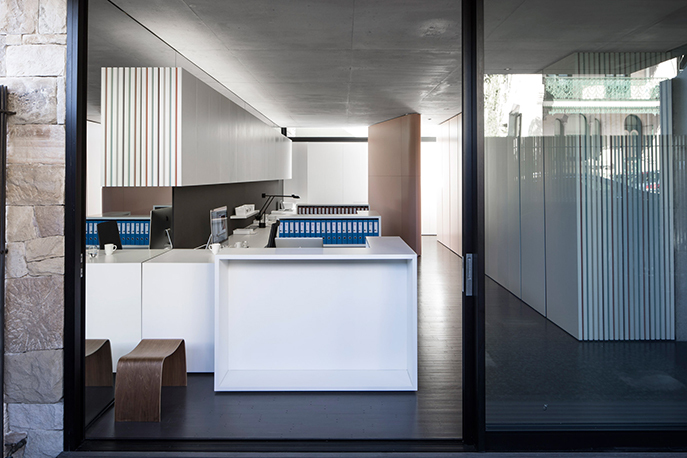 The concrete box at the front of the property contains the owners' home on its upper levels, with an office on the ground floor shielded behind a steel screen and garden courtyard. A pink pivoting steel door towards the rear of the office can be used to separate off a space with a fold-down bed. 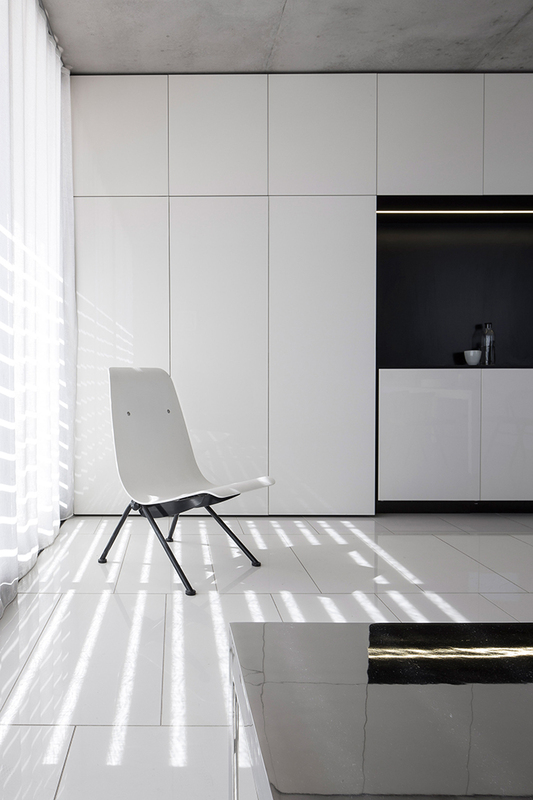 Coloured surfaces matching the hues of the louvred screen are concealed on the inside of the white joinery. 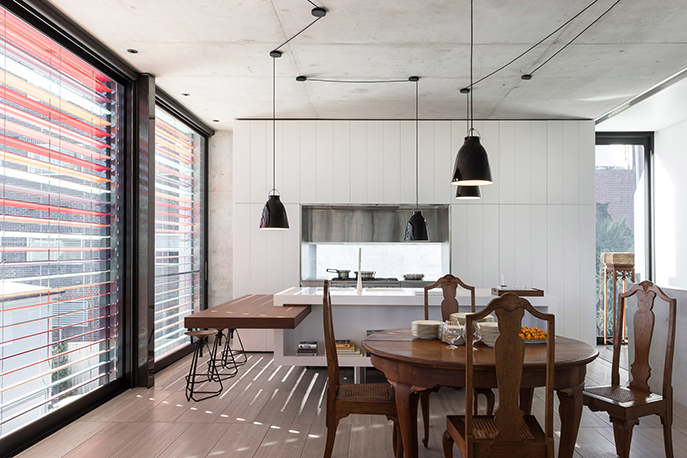 The living areas on the upper floors are arranged as a series of open and connected spaces, with large windows framing expansive views of the city. 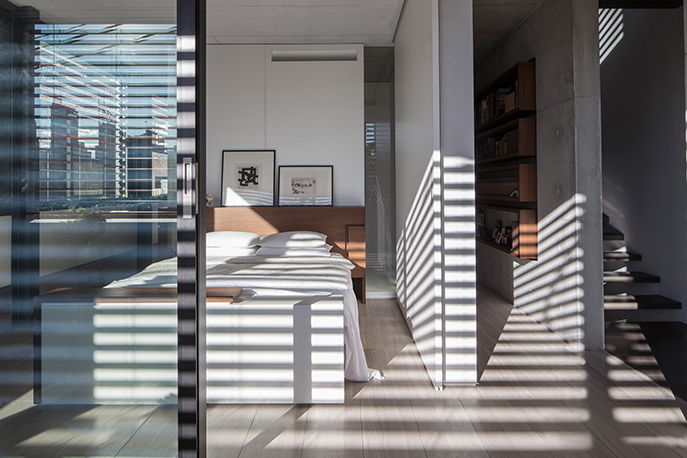 "The planning is based on the provision of simple Miesian-inspired volumes," said the architects, referring to the work of German architect Mies van der Rohe. 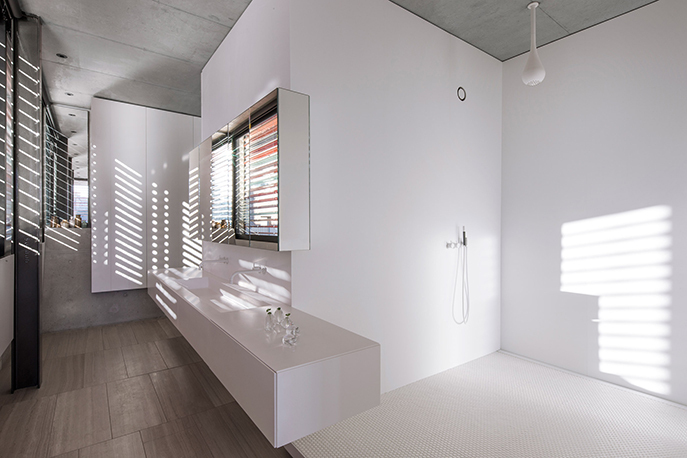 "Rooms are created by the insertion of floating planes and joinery 'pods', resulting in flowing spaces and varying levels of privacy and separation," they added. 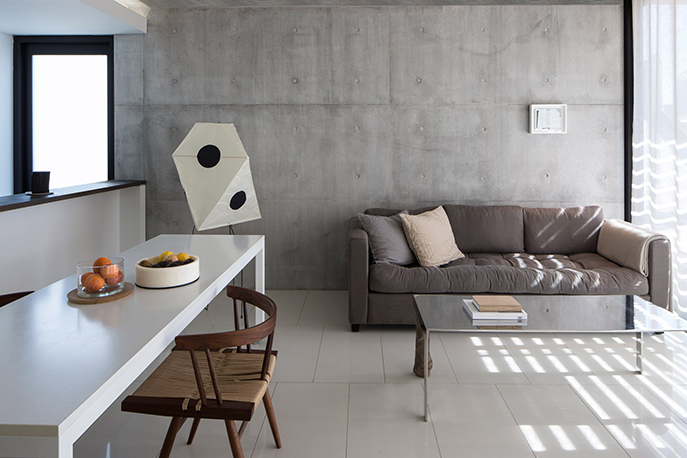 Between the two concrete volumes, a private courtyard features a composition of simple geometric planes that recalls the internal layout. A cantilevered concrete bench extends from a black granite plunge pool, while timber decking, a stone wall and a wall covered with climbing plants contribute to the peaceful and intimate setting. The building at the rear of the plot contains a studio apartment situated above a garage. 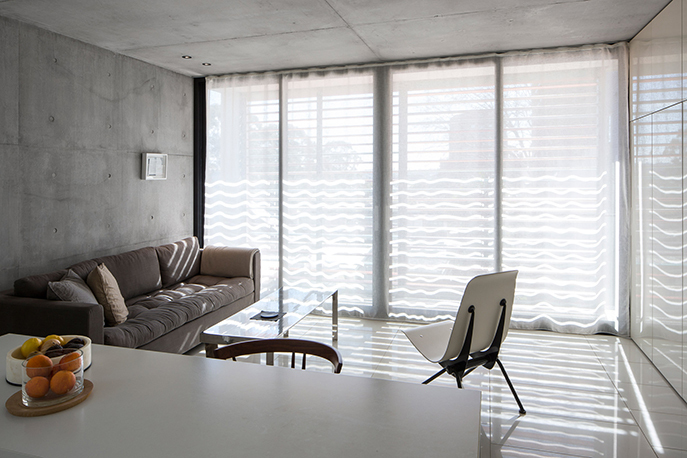 Circulation is positioned around the south and west to enable the room to open onto a north-facing balcony. 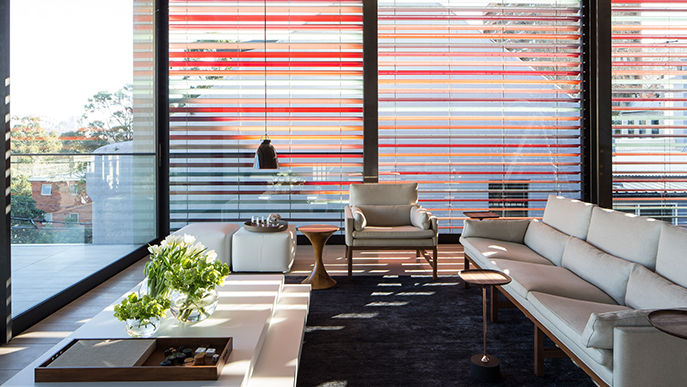 Throughout the home, travertine stone floors, timber stairs and concrete walls and ceilings create a neutral backdrop, with the louvred screens introducing instances of colour. Furniture is used to conceal services and audio-visual equipment, including shelves and a self-opening television compartment in the master bedroom. A coffee table in the living area also contains a hidden television and speakers.